I finally got a photo of a banner that I’ve seen on many jeepneys plying the Katipunan route. This appeared on jeepneys a couple of weeks ago and the message on it is clear: “No to more jeeps, to more traffic in Katipunan.” I became curious about this as I noticed that list of transport groups that had their names printed at the bottom of the tarpaulin. Noticeable is the absence of one group, Pasang Masda, among the list that includes, among others, LTOP, ALTODAP and the party list group 1-Utak, which used to have a seat in the Philippines House of Representatives. Tarpaulin sign hanging at a wire fence at the Katipunan jeepney terminal under the Aurora Blvd. flyover. Pasang Masda is supporting the Comet jitneys currently plying the North EDSA-Aurora Boulevard route (via Mindanao Ave., Congressional Ave., Luzon Ave. and Katipunan Ave.). In fact, the head of the group is reported to have bought a few units, likely convinced of it as a good investment. Is it? Only time will tell considering its route is not necessarily the best for it, overlapping with several jeepney routes including the UP-Katipunan route. Is the Comet a game changer? So far, it isn’t and that’s mainly because of its single roue that’s not exactly favorable for a demonstration of the vehicle’s capability and claimed advantage over the conventional jeepneys. A colleague even says that it seems the route approved for it doomed its operation in the first place. But that’s an entirely different story from the opposition to it that’s stated in the tarps at the Katipunan jeepney terminal and some of the jeepneys plying the route. So, is it a “no” to more jeepneys because their numbers are really already excessive OR is it a “no” because the additional jeepneys are from other groups or those not affiliated or in league with the undersigned? It seems that the latter case applies here and this should be taken as an example of what to expect along the way as initiatives to phaseout or replace conventional jeepneys get going. It is a bit complicated due to mainly to the social aspects of a phaseout or replacement but it gets more complex with the personalities involved including and especially the leaderships of various transport groups. We were invited to the opening of an electric vehicle assembly plant in Cavite recently. BEMAC Electric Transportation Philippines, Inc. formally opened their plant last February 11 at the Almazora compound at the Golden Mile Business Park in Carmona, Cavite. We were very impressed at the plant and learned that BEMAC is partnering with Almazora, a local company specialised and experienced in vehicle body assembly. I am sharing photos I took of the plant so readers can have an appreciation of what an assembly plant looks like. BEMAC’s e-tricycle model, the 68VM, has a comfortable seating capacity for 6 passengers at the back with the driver the sole occupant of the front seat. Assembly line showing the chassis of the e-trike and the body being assembled. 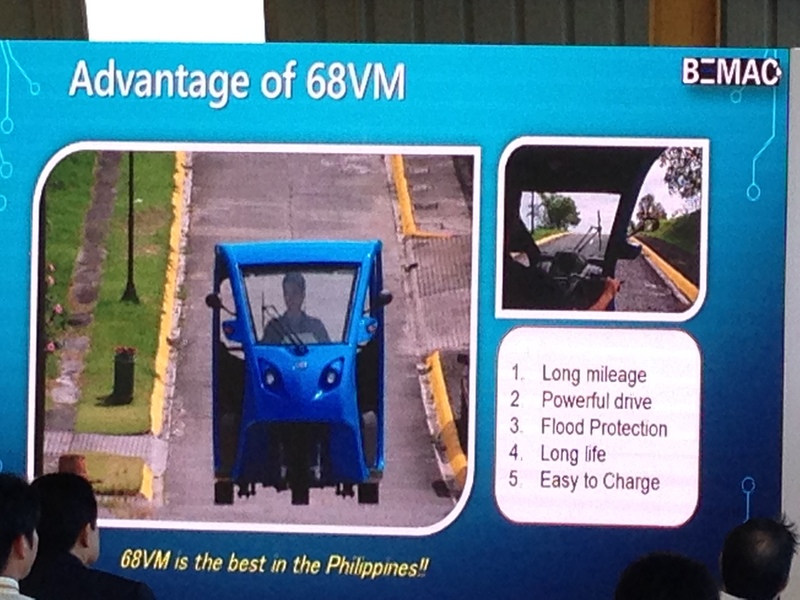 BEMAC’s e-trike model is the best we’ve seen so far among e-trike models in the Philippines. It is supposed to have been tested under various conditions except actual (or simulated) operations that are closer to real-world conditions (i.e., operation as conventional tricycles in the country). It is claimed to be capable of running at a top speed of 80 kph and its motor can power the vehicle up steep slopes, which is a typical feature in many municipalities and cities in the Philippines. Details for BEMAC Philippines may be found in their website. There will be an Electric Vehicle Summit on February 26-27, 2015. The 4th Philippine EV Summit will again be held at the Meralco Multi-Purpose Hall in Ortigas, Pasig City. The two-day summit organised by the Electric Vehicle Association of the Philippines (EVAP) in partnership with Meralco and the Partnership for Clean Air (PCA) will feature an exhibit on the current electric vehicle models available in the Philippines, which I think is among if not the main highlight of the summit. There will also be several talks and panel discussions on e-vehicles including those on technology/R&D, industry, incentives and green communities. The program also mentions a lot about sustainable mobility, a term prolifically used by advocacy groups but not really one I’d attribute to e-vehicle proponents (One colleague made the observation before that not everyone is really into e-vehicles because of its environmental aspects.). I’m not sure all the top officials they invited will show up or give good talks. Past summits had good potentials as venues for serious discussions that could have led to fruitful outcomes. However, it seems that they fell short of these objectives and ended up with boring talks that to me often were reduced to lip service from government agencies especially on topics like incentives that will pave the way for the turning point for e-vehicles. Hopefully, this year’s talks would be more interesting and engaging considering the plenary set-up where people farther from the front tend to have meetings and discussions of their own. E-vehicles have a great potential in improving air quality in a country like the Philippines. There is also the promise of less noise and, more important to many especially operators and drivers, better revenues than translate to increased incomes to those dependent on it for their livelihood. We look forward especially to the transformation of the tricycle sector from the current conventional trikes to the more modern and environment-friendly models such as those by BEMAC. 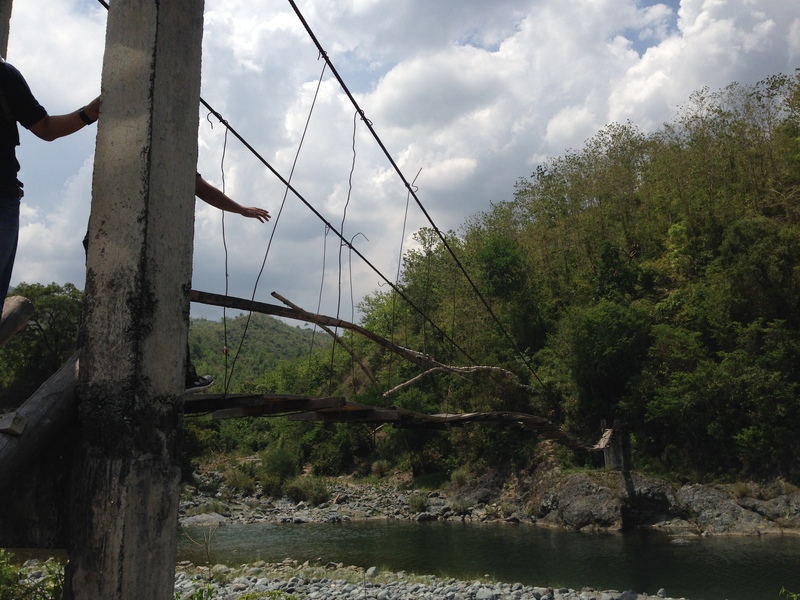 The Antipolo City Government recently re-opened the Hinulugang Taktak park to the general public. The National Park and its famous waterfalls have seen better days and is part of Antipolo lore, immortalized in songs and stories about the pilgrimage city. It has been rehabilitated with various initiatives the past few years and with the water again flowing strongly compared to the trickles of dirty water over a decade ago. 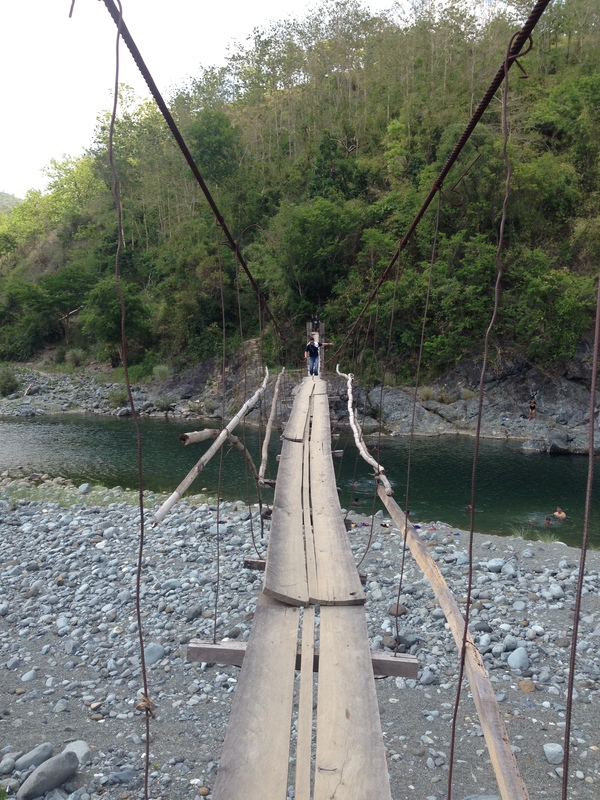 Somewhat lost in the promotion of Hinulugang Taktak is a piece of transport history. I am referring to the old railway station located near the gate to the national park. 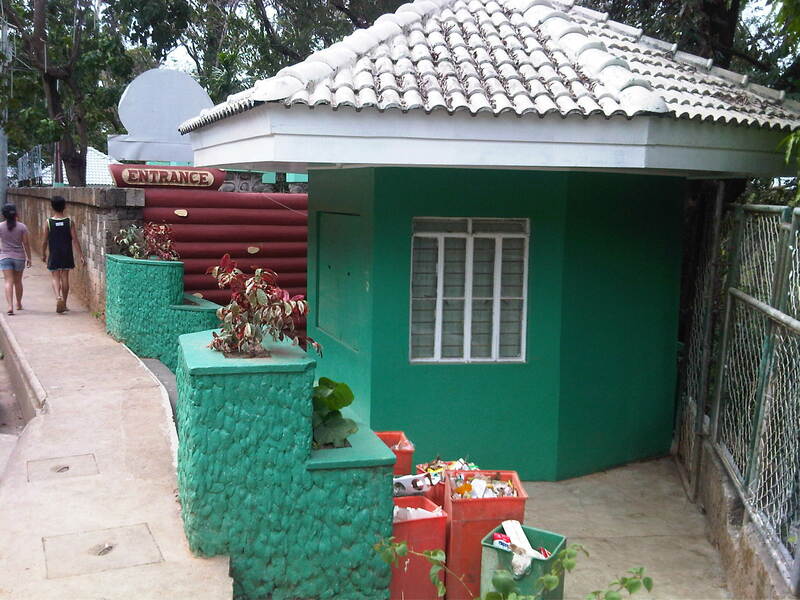 The most convenient and probably most comfortable way to Antipolo and its two main attractions, the Shrine of Our Lady of Peace and Good Voyage and Hinulugang Taktak, many decades ago was by railway. Roads and road transport was not as good as today’s. There were no highways like Ortigas or Sumulong. There were no aircon buses, no jeepneys (yet) and cars and motorcycles were not affordable to most people. Old sign? There is no formal historical marker for the former railway station at Hinulugang Taktak. I think the National Historical Commission of the Philippines should recognize this as a local if not national heritage site. Trees notwithstanding, this is the view from what used to be the platform of the railway station. An old drinking fountain that’s probably survived the passing of time and witnessed a lot about the old railway station and Hinulugang Taktak. What’s left of the former railway station structure are the platform and columns. Taktak Road was the old Daang Bakal or railroad. Much have changed since the glory days of rail with a line that connected Antipolo with Manila. The view from the old entrance to Hinulugang Taktak in what also looked like the old railway station’s ticket office gives people (passengers?) a glimpse of the waterfalls. The old entrance to Hinulugang Taktak. Someone asked me before if I thought it was possible for old railway lines to be revived. I replied honestly that I thought it was possible but immensely difficult. For one, a lot has changed in the lands on and along which the old railways used to be. The old Daang Bakal, for one, now passes through private residential subdivisions and industries and is now comprised of busy roads. While nothing is impossible, to rehabilitate the old railways will be a great challenge in the financial and social sense. 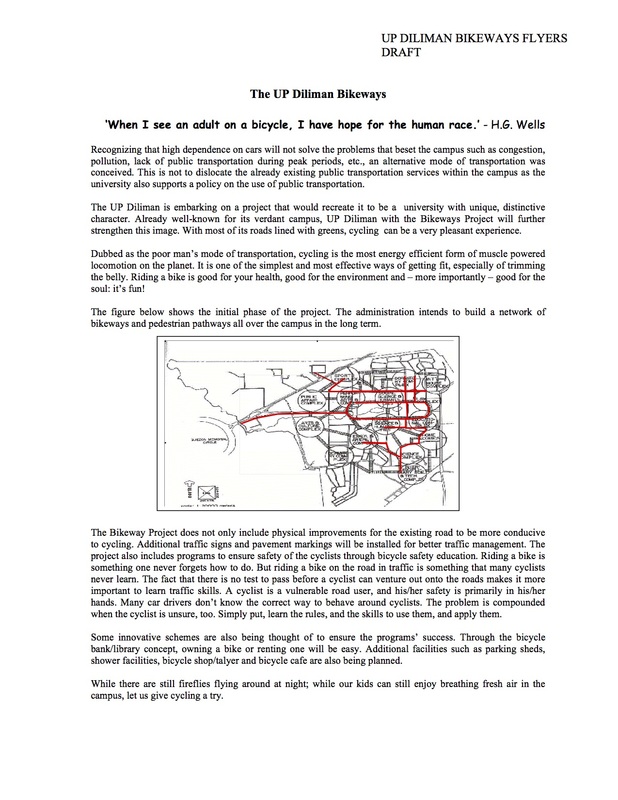 It would be nice to see realized but requires so much from so many people, agencies and local governments who need to commit to such a project. And it requires leadership and a talent for convincing people that it is the right thing to do and that it needs to be done. I posted something recently on an old bus line plying routes between Rizal and Metro Manila. I mentioned there about bus companies somehow being resurrected many years after what I thought were my last sightings of their buses. Of course, it is known that some bus companies have closed shop for one reason or another including what was a government-owned and operated Metro Manila Transit Corporation that used to operate the popular Love Bus. One of the major causes for bus companies folding up is labor problems. 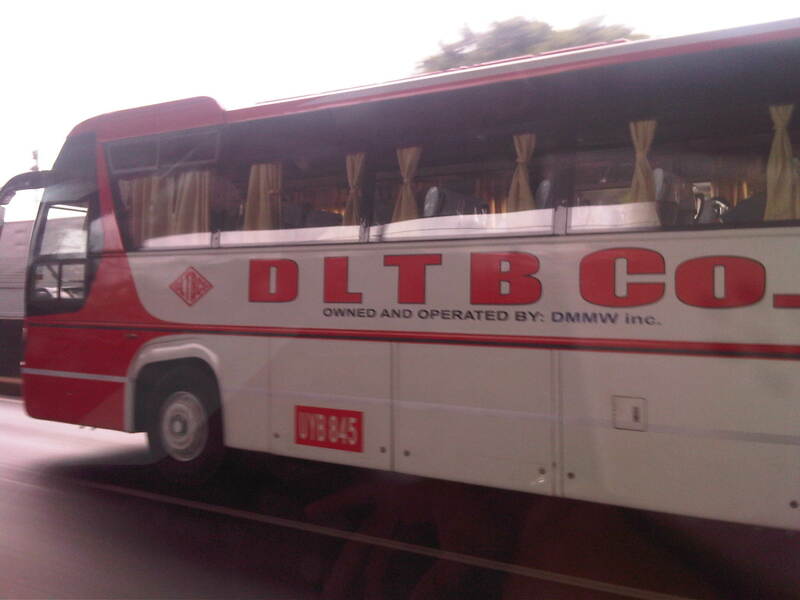 Among those that reportedly succumbed to this were Philippine Rabbit, Pantranco and BLTB Co. A few years ago, however, we was surprised to see a familiar bus along the South Luzon Expressway but upon closer look, we found that it wasn’t the old BLTB Co. that was written in the livery but DLTB Co.
BLTB Co. stood for Batangas, Laguna, Tayabas Bus Co. The name alludes to the provinces served by their buses including Tayabas, which eventually became Quezon and Aurora provinces. Their terminal was landmark along EDSA in Pasay City. It is still there along the southbound side and near the junction with Tramo. That will be just beside the left turn overpass from EDSA to Tramo and towards NAIA. The livery on this bus is very familiar to many who rode on the old BLTB Co. buses many years ago. Was this deliberate from the owner/operator who obviously wanted to use this to their advantage? People are still familiar with the BLTBCo logo and brand so seeing these buses evoke memories of long distance travel back in the day. There were few large bus companies in the old days. Among them were Victory Liner, Dangwa, Philippine Rabbit, Pantranco and BLTB Co. Victory, Dangwa and Philippine Rabbit served routes to the north of Manila while Pantranco plied both northern and southern routes. The latter company eventually split into Pantranco and Philtranco, with the northern routes under Pantranco (whose terminal was along Quezon Avenue where Fisher Mall now is located) and the southern routes under Philtranco (terminal is still there along EDSA in Pasay City). Pantranco is no more but Philtranco survives despite the current competition from many other bus companies plying routes south of Metro Manila. Dangwa’s terminal was in what is still now being referred to as Dangwa in Manila, where you can get all the flowers you’ll need for all occassions. It was, after all, the “bagsakan” of flowers from the north, particularly from Baguio City. Victory’s old terminal is still the one in Pasay though it now has a couple in Cubao. It has expanded its points of destination and is perhaps the largest firm now operating north of Metro Manila. The Philippine Rabbit Bus Co.’s terminal was at the northbound side of EDSA in the Balintawak area. It has a curious story about it; the stuff of urban legends. The name of the bus company is supposed to be Philippine Rapid Transit (another and real bus company). One time they asked their new buses to be painted, the instructions were misunderstood. “Rapid” sounded like “Rabbit” and that stuck to this day. They also had a labor problem and did not operate for a while until they resolved these issues with their drivers and conductors.